Delmonico Steakhouse is a longtime fixture of the Venetian Hotel in Las Vegas, and just a short and pleasant walk away from the Wynn where we stayed this time. While other restaurants in the Venetian have come and gone, this classic steakhouse owned by celebrity chef Emeril Lagasse endures. We’ve had the pleasure of dining here several times over the years and enjoyed our latest experience this past December, although some of its past magic seemed missing. It could be that we’ve been here a few too many times, have experienced better steakhouses, and that some of the novelty has worn off. There is a slightly tired look to the decor, a spareness that may have been more fitting about fifteen years ago. Compared with the fresh, open and even whimsical decor characterizing most of the restaurants at the Wynn, Delmonico felt a bit drab and buttoned up – could use a bit of re-imagining. Note that we were not seated in the larger section of the dining room, whose low vaulted ceilings have always intrigued us and made us think of a Tuscan wine cellar. We were seated in a room that was rather square and dimly lit, but maybe also quieter than the main area where large groups seemed to have been assembled. 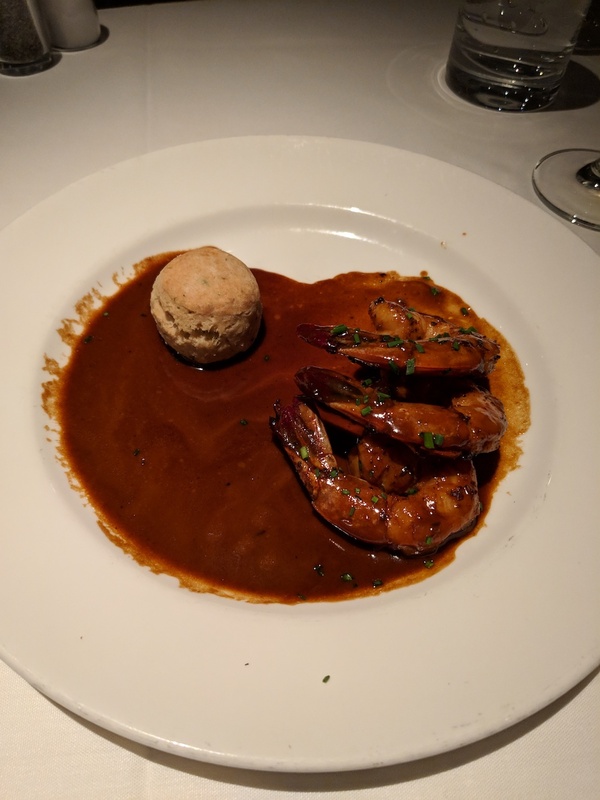 We started with Emeril’s New Orleans Barbecue Shrimp, apparently the most popular appetizer on the menu which we have never tried. Unfortunately, it didn’t set the best tone. Somewhat overcooked and the promised ‘New Orleans flavors’ a little lacking, even dated maybe? The rosemary biscuit was tasty. 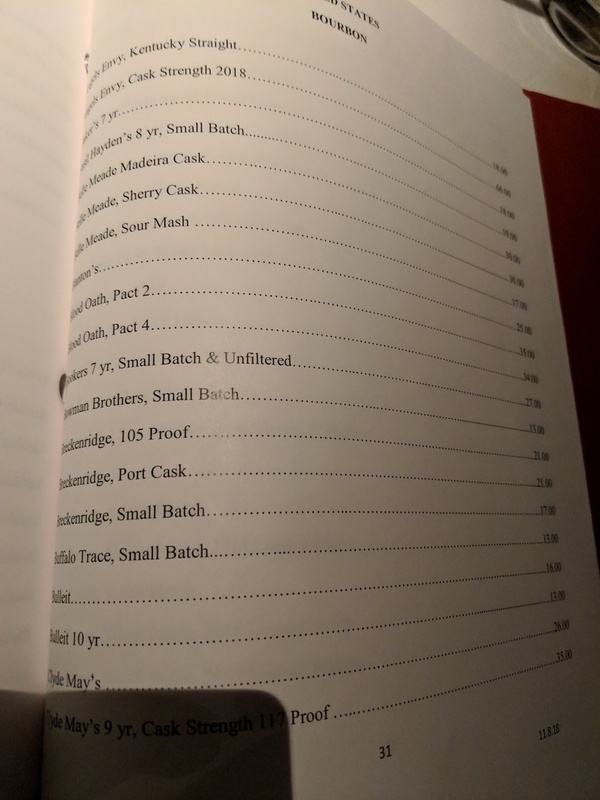 Having said all this, the steak, wine, bourbon selection and overall service was excellent. And let’s get to the wine. 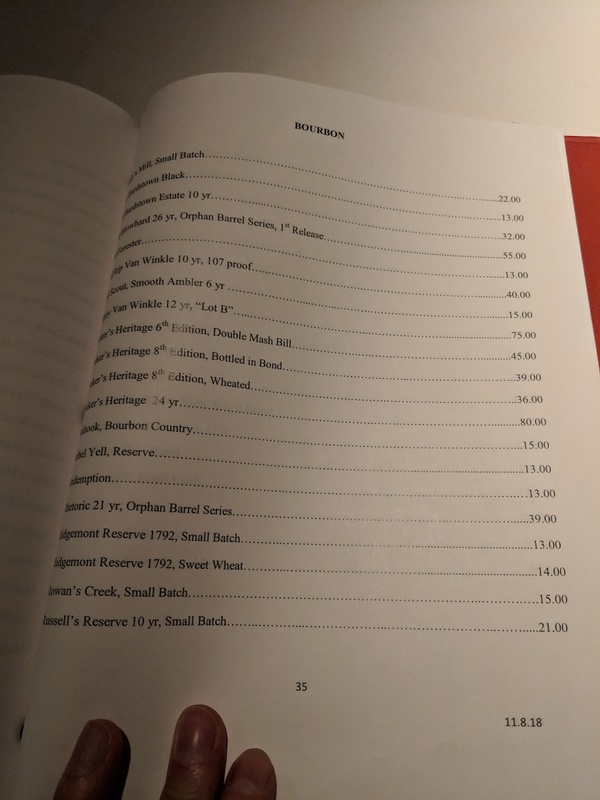 Apparently boasting over 2,300 selections, the wine list at Delmonico was indeed impressive and studded with rare finds. We wanted something big – make that huge – to go with our steak. 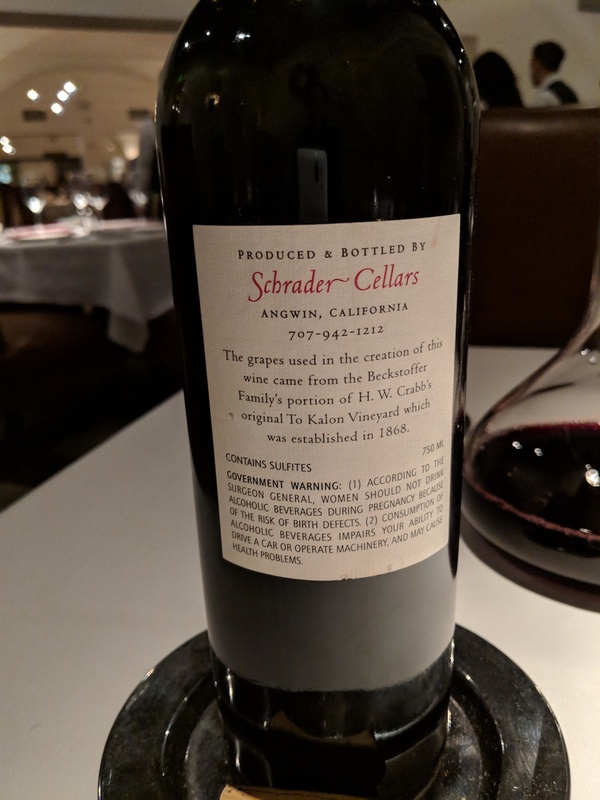 With some guidance from the knowledgeable sommelier, we selected the 2008 Schrder Cellars Cabernet Sauvignon (one of their last bottles, apparently). The wine had a dark, velvety red-black color, with deep dark fruit flavors, like cherry and blackberry. 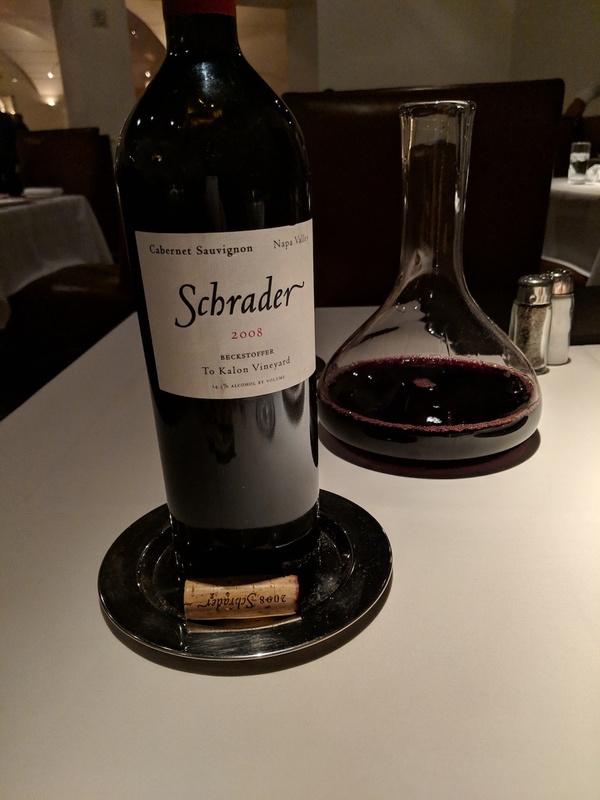 It opened up in the decanter as the evening wore on, and we sipped it slowly, savoring and enjoying. It may well be the first and last time we will ever have this rare, elegant, and bold wine. A perfect match for the rich beef and hearty steakhouse sides. Have not seen the likes of this before! 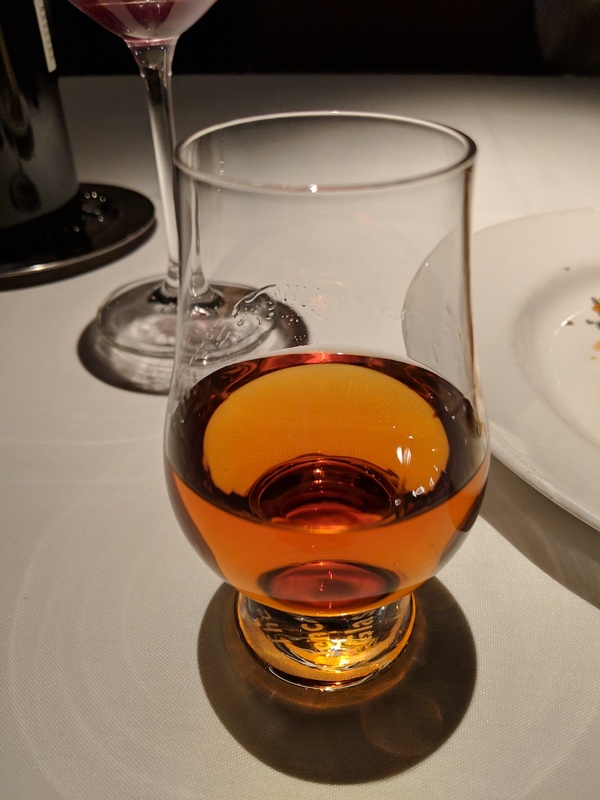 I was content to finish the last sips of the Schrader cab, but for my partner – a glass of Pappy Van Winkle – Van Winkle Special Reserve 12 Year Lot B. The smell, deep color, and full-bodied taste was exactly what he was looking for. His theory is you need to grab this whenever you see it, and those occasions have been few and far between. 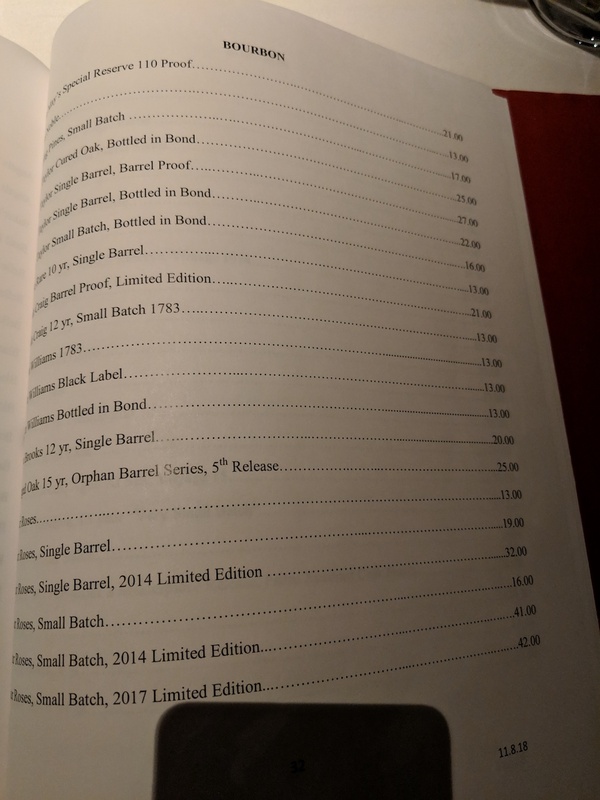 An impressive bourbon menu for the whiskey lover! Last but not least, we move on to dessert. 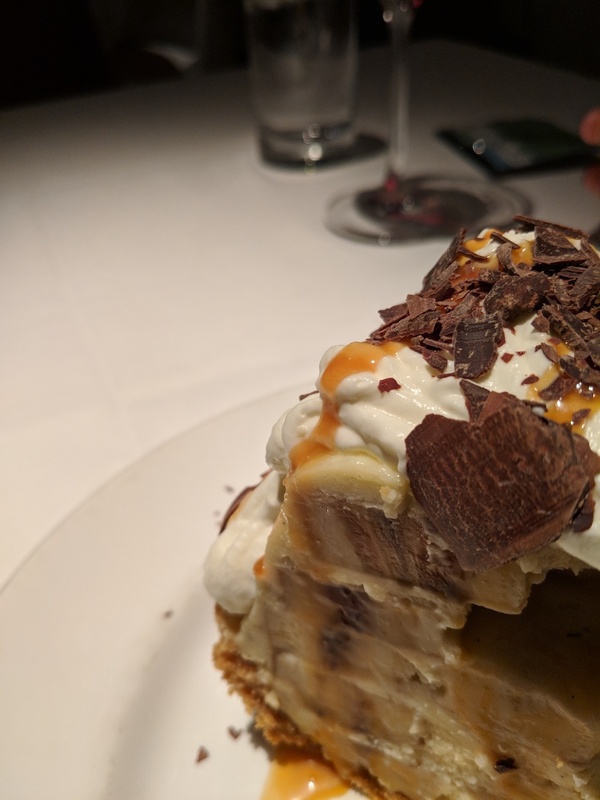 Emeril’s Banana Cream Pie has been something of a legend in our fond recollections of past Delmonico experiences. The mounds of chocolate shavings and generous drizzle of rich caramel sauce have loomed large in our minds over the years. It’s funny, it was certainly tasty, but not as unique and wonderful as we remembered – of course, it could be a matter of letting good things grow better in your mind. 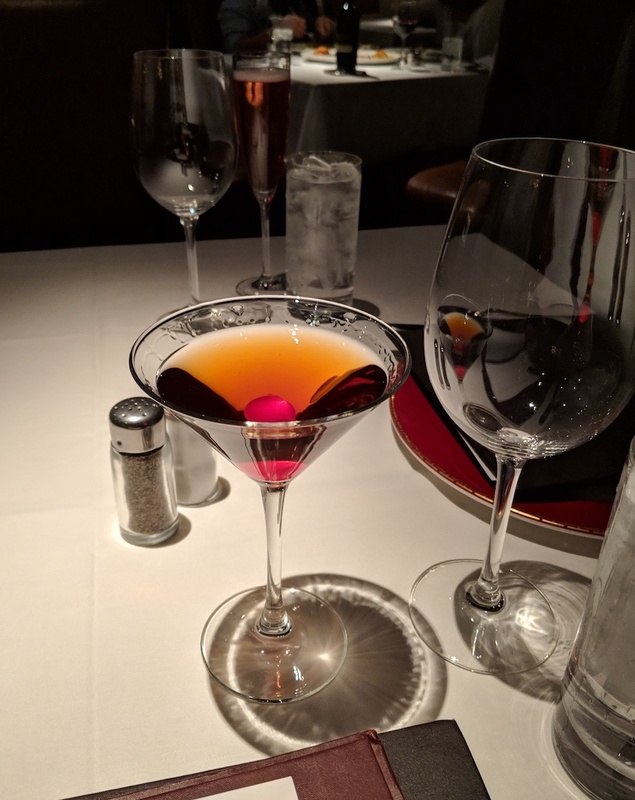 Though it didn’t quite match the past experiences of our memories, Delmonico Steakhouse has much for you to enjoy – excellent steak, stellar wine selection, great service and an amazing selection of bourbons. Delmonicos, owned by celebrity chef Emeril Lagasse, is located in the Venetian Hotel, Las Vegas, Nevada. For more information or to make reservations, call (702) 414- 3737. Food: Delmonicos steakhouse certainly delivers what it promises – incredible beef entrees. There are other selections, to be sure, with a daily changing menu to accompany the standard beef and lamb offerings, featuring interesting fare. 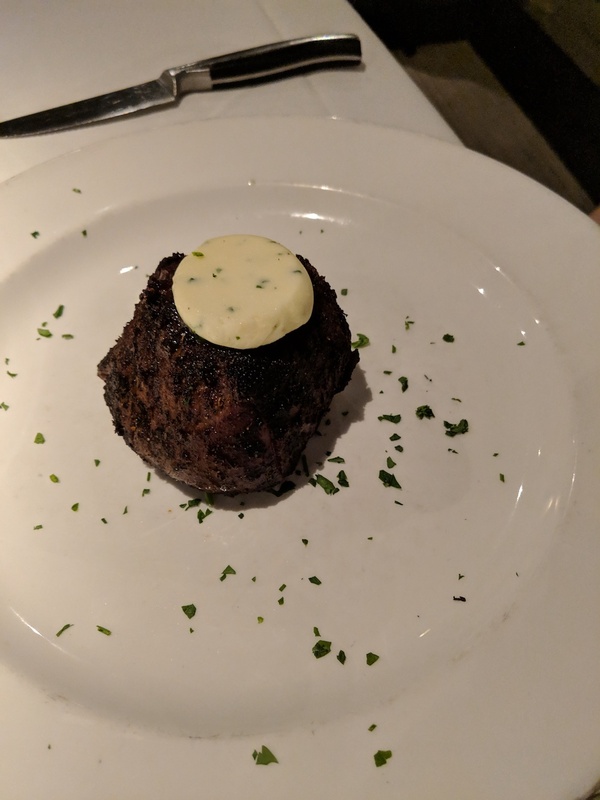 We did try the beef, the buttery tender filet mignon ($38) and the famous and huge bone in prime rib steak ($44 and perfect!) with absolutely no regrets. 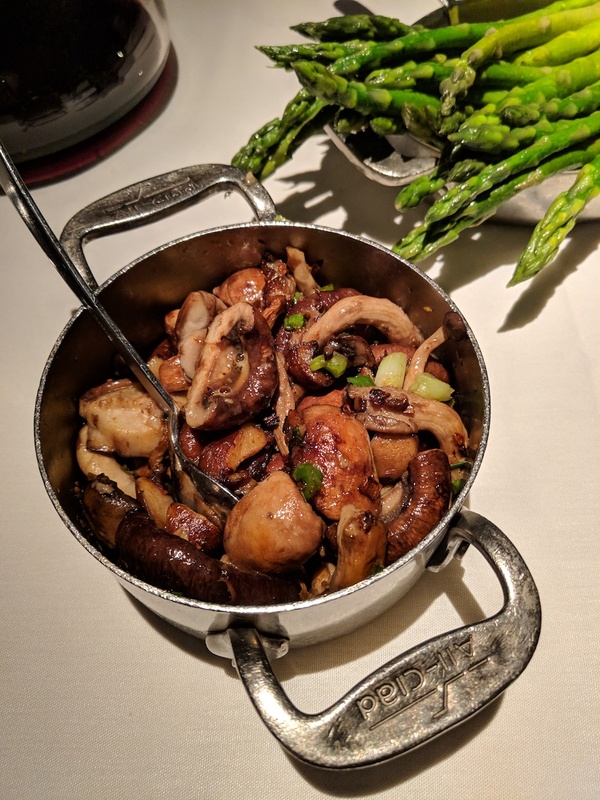 To start, we sampled the foie gras ($18), a more pleasant variation than that experienced at Bradley Ogden’s on a previous night, but less heavenly than that offered at Picasso (still our pick for best foie gras and best restaurant in Las Vegas). Our waiter suggested a pleasant Sauterne to accompany it, and it certainly fit the bill! We had Caesar Salad for two ($22), prepared tableside, with a “Bam!” thrown in along with generous amounts of garlic and parmesan. The salad was particularly good, traditional and perfectly powerful. Along with our beef entrees, we ordered sides to share: Country Smashed Potatoes ($7.50) and green beans (also $7.50). The potatoes were wonderful, sticky,creamy, and garlicky, and the portion was huge, even for sharing. The beans, sauteed in butter and garlic, were a bit on the undercooked and crunchy side, constituting the only (slight) disappointment in the meal. For the highly unnecessary but scrumptious dessert, we tried the homey apple pie a la mode ($8.50). Wine: David Arthur Cabernet Sauvignon, 2001 ($395). Probably too soon to drink, but then again, it was a pretty rare find! Incredibly big and bold, this deep red wine was over the top and wonderful for it. Exceptional Features: Excellent service, attentive, friendly and very professional. Service: Our server was attentive and offered good food and beverage pairing suggestions. When asked what he hears probably all too frequently, “So how much is Emeril actually involved in Delmonico’s?”, he patiently explained that Emeril visits Delmonicos at least once a year, and keeps abreast of major changes to the menu. He then supplied us with written information and small Delmonicos keepsakes. He even invoked Emeril Lagasse to some extent with a subtle “Bam!” as he added freshly ground pepper to the Caesar Salad he prepared tableside. Besides our main server, other wait staff insured that our bread basket was perpetually filled with warm rolls, and that our water and wine glasses were constantly replenished. Décor: We were somewhat surprised by the décor of Delmonicos, our perceptions perhaps being prejudiced by the image of Emeril Lagasse’s brightly lit, rustic cooking show set. Delmonicos, by way of contrast, is dimly lit with low, vaulted ceilings designed to look like a wine cellar. The bone color of the ceiling keeps the room from feeling totally cavernous, however. Extremely comfortable brown leather chairs grace the tables. The overall effect is quite contemporary. Dress Code: Business or resort casual is appropriate here. You may encounter the range in dress typical of Vegas, but most opt for this attire. Price: Beef entrees hover around $40, and this is without accompaniment. Food is certainly worth it, but it does not come cheap. 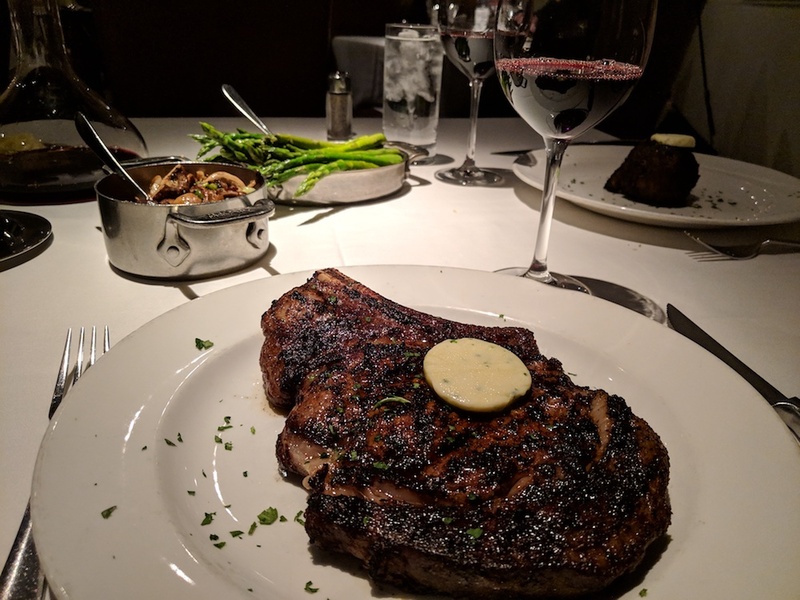 Reservations: We would certainly recommend reservations for Delmonicos. Even with reservations, we waited for our table, albeit briefly, in the lounge. For reservations, call (702) 414- 3737.